In late July, Metro Aviation invited me to visit them in Shreveport, La., to test out a new aircraft that would be — in part — unlike any other flight evaluation I’ve ever completed. The subject was the EC145e, and the reason the evaluation would be unique is that, unlike most new models in its class, the “e” is not the next technological evolution of its predecessor, which in this case is the EC145 (known as the BK-117 C2 on its type certificate). 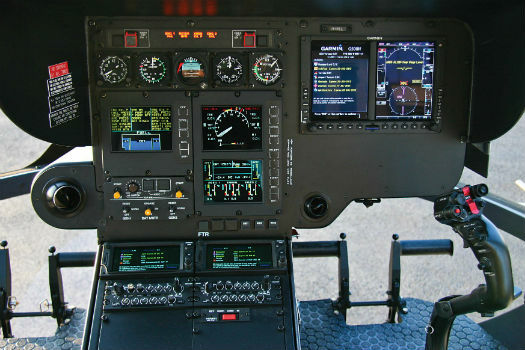 That evolution — resulting in an aircraft with bigger engines, full authority digital engine control (FADEC), glass instrumentation and instrument flight rules (IFR) panels that feed high-end flight control systems — has already taken place, and it resulted in the H145 (formerly known as the EC145 T2). 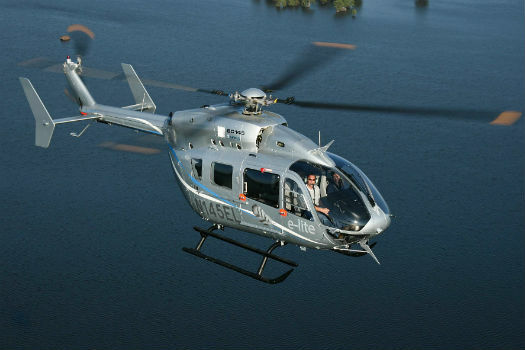 Instead, the EC145e represents something of a back-to-basics approach from the manufacturer. The prototype EC145e was created to be a light version of its predecessor, largely achieved through the removal of the EC145’s single pilot instrument flight rules (SPIFR) avionics package and autopilot. Airbus Helicopters proposed the prototype as a utility aircraft to prospective customers through demonstration flights around Europe. However, there appeared to be little interest in the new aircraft — until Metro Aviation stumbled across it while on a trip to Airbus Helicopters’ facility in Donauwörth, Germany. 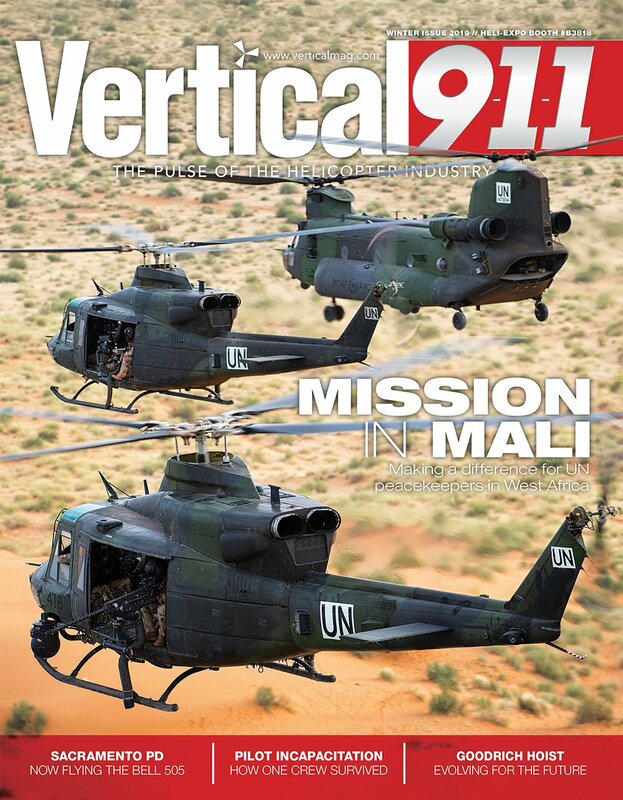 “We felt that it was going to be a very good candidate to replace the older VFR [visual flight rules] EC135s and BK-117 A1 through C1 versions [in the Metro fleet] — and would also fill a void that was going to be created by a production halt of the EC145,” explained Milton Geltz, Metro’s managing director. He also thought the EC145e would be a good candidate to replace Metro’s MBB Bo.105s. 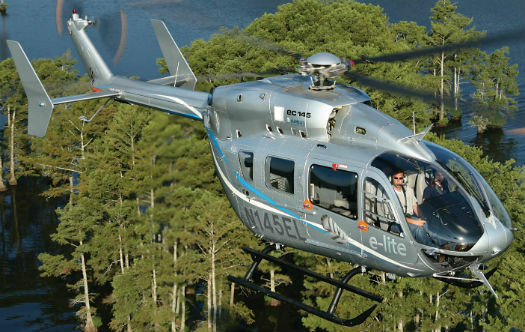 The EC145e represents a back-to-basics approach from Airbus Helicopters. 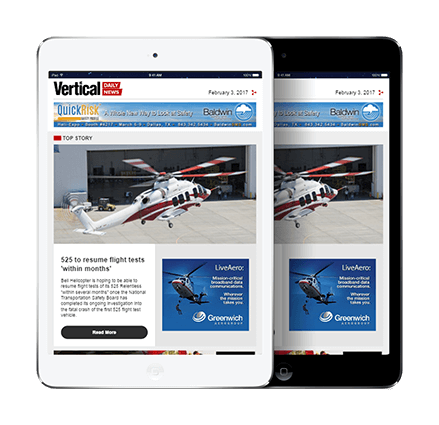 A unique collaboration with Metro Aviation has brought this “Lite” visual flight rules (VFR) version of the recently discontinued EC145/BK-117 C2 to operators in North America. While Airbus wasn’t certain it was going to go forward with the EC145’s development, Metro encouraged it otherwise — and part of that encouragement was placing a pretty substantial order for the model. 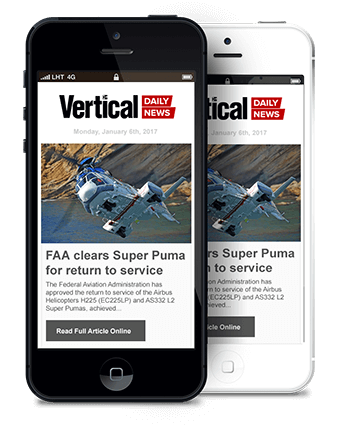 “Without our order, the aircraft was not going to be produced,” said Kristen King Holmes, Metro’s director of marketing. One of the reasons that Metro has enjoyed such success over the years is because of its innovative approach to products and services. Recognized as an expert in Airbus Helicopters completions, in addition to its extensive operational arm, the company recently established a new training center to further round out its offering. Just like Steve Jobs’ approach at Apple, Metro president Mike Stanberry and his team are well known for bringing products to market that one didn’t know they needed until they saw it. It also has an uncanny history of developing products and services for its own operations that will soon be in high demand by outside users. The EC145e project is a combination of all these factors. The EC145e “e-lite”, as it is being marketed by Metro, is a very plain, utilitarian aircraft. The basic aircraft from Airbus will be equipped with one Garmin GTN 650, a G500H, a radar altimeter, one audio panel, and pilot and copilot seats. FADECAirbus was going to abandon the EC145 model in favor of its higher powered, FADECequipped offspring — the single-pilot instrument flight rules (SPIFR) H145 (formerly known as the EC145 T2) — until Metro convinced it to build the “e” version of the aircraft. (HTAWS), and weather displays. The Genesys HeliSAS will also be offered, and is sure to be a popular option. Compared to a comparably equipped SPIFR EC145, Metro’s EC145e will give the operator about 330 pounds (149 kilograms) more useful load, while sacrificing only the SPIFR capability. The EC145e should be huge for operators who want the cabin space and utility of the H145, but do not want to be forced into a SPIFR package to get it. Consider that a fully completed EC145e from Metro, including a mission package (such as HEMS) and HeliSAS will cost significantly less than a HEMS-configured H145, and about the same as a comparable mission-ready EC135 T2/P2. The EC145e will also cost much less than the now discontinued EC145 configured with the same mission package, including HeliSAS. But if IFR is a must, then the operator will have to bite the bigger bullet, as the EC145e is VFR only. The business model wrapped around this aircraft is unprecedented for Airbus. For the first time, EC145s can be sold directly through Metro as a one-stop shop. Of course, one can buy the “green” EC145 from Airbus and have it completed elsewhere, but Metro’s business plan is to provide a single source — from initial specifications to final delivery and training. 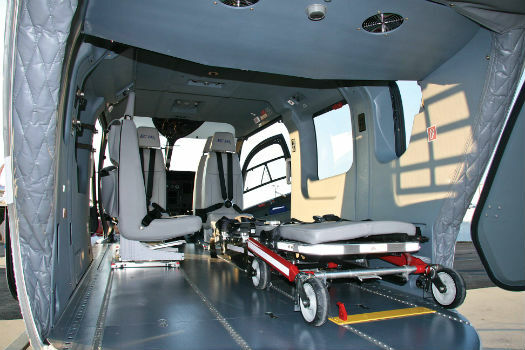 Additionally, Metro will be offering their customers a leasing program for the EC145e — a clear indicator of its confidence in the residual and resale values of this pickup truck of a helicopter. 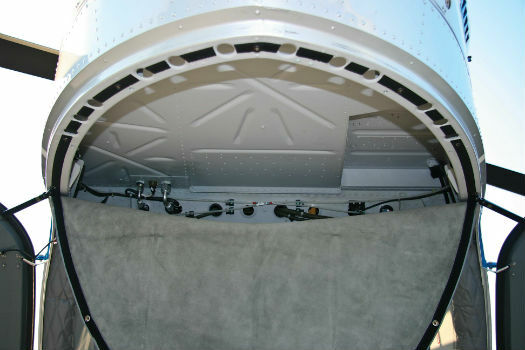 With the weight reduction in the nose (through the removal of the SPIFR avionics), Metro was able to eliminate the need for the aft ballast kit that would be mounted here above the tail stinger, yielding another 44 pounds of weight savings. Taking a tour of the airframe, the deletion of the heavy three-axis autopilot means the avionics bay under the aft floor is now empty and available for other uses, such as additional fuel. Adding the HeliSAS will only add back about five percent of the weight of the deleted SPIFR autopilot, but the benefit is clear in safety, workload, and fatigue reduction. The heavy panel displays are also gone, and are replaced by the Garmin G500H. Finally, all the computers and equipment that support the SPIFR package are also removed. In fact, a look into the upper section of the aft cabin that would house much of this gear on an avionics shelf now reveals a completely empty space — representing a saving of 50 to 75 pounds (22.5 to 34 kilograms). With the weight reduction process that Airbus went through with the EC145, it found that it could remove the active vibration absorber in the nose. Accordingly, with that and the additional avionics removals, Metro was able to eliminate the need for the aft ballast kit, yielding another 44 pounds (20 kilograms) of weight savings. All these reductions mean a useful load of almost 3,000 pounds (1,360 kilograms) for the basic Metro EC145e — resulting in increased utility in operations. With the EC145e, VFR operators who want the familiar large cabin of the BK-117 series do not have to buy the much more expensive SPIFR H145 to get it. It’s also worth bearing in mind that the cost savings provided by the EC145e are beyond the lower ticket price. By studying the BK-117 C2 service reports, Metro became convinced that by offering the lighter non-FADEC equipped EC145e, the availability of the airframe on the line could be increased by at least 10 percent. Accordingly, it also believes that the costs to operate the EC145e can be reduced by 10 percent or more. Much of this is due to the relative simplicity of the systems — especially the avionics — compared to the SPIFR BK-117 C2, and even more so when measured against the new FADEC-equipped H145, which only comes from Airbus as an SPIFR ship. 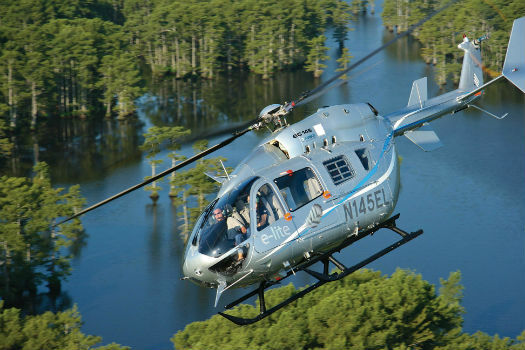 Because the EC145e is type certified by the Federal Aviation Administration (FAA) as a variant of the BK-117 C2 — and not a new model — every option that that was available to that aircraft from Airbus is also available to this airframe. And, of greater importance to Metro and its customers, every STC that Metro holds for the BK-117 C2 will transfer over to the EC145e; no amendments to the STCs will be required, so there will be no additional cost recovery when equipping the EC145e. The upper section of the aft cabin that would house much of the SPIFR avionics shelf now reveals a completely empty space — representing a saving of 50 to 75 pounds. Although this could be enough of a story in and of itself, Metro did invite me to fly the EC145e. And who am I to disappoint them?! Mathew Michaelson, Metro’s chief maintenance check pilot, would guide me through the flight. 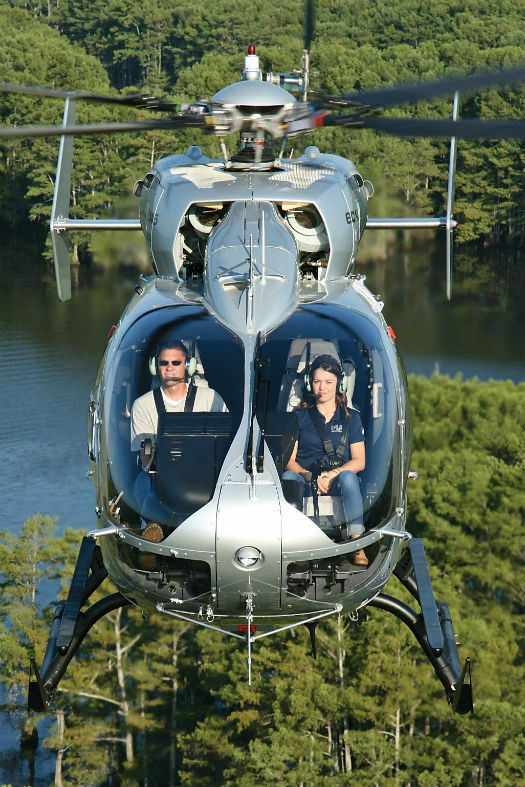 Settling into the right seat, I quickly became comfortable with the surroundings, which are very similar to the EC135 P2+ I flew for many years. And when the aircraft is simple, the start follows suit. The battery master is turned on, and the central panel display system (CPDS) is tested. Basically, there is nothing in the aircraft, so it’s prime pumps to “on” and test the fire lights and the vehicle and engine monitoring display (VEMD). The ship flown by Vertical sported a clean but highly functional panel, with dual Garmin GTN 650s and a Garmin G500H. Soon to be certified in the model will be the Genesys HeliSAS. After making sure the first limit indicator is showing turbine outlet temperature (TOT) as primary, set the twist grip throttles to the 20 percent preselect detent and then engage the start switch for the desired engine. With no FADEC on board, you modulate the twist grip slightly to keep the TOT within the proper starting range. The starter disengages at 40 percent N1. The twist grip is then rotated to 70 percent, +/- two percent N1. Our idle was on the lower side with just the first engine running. With good engine and transmission oil pressure indications, the hydraulic check was next. By the time that was completed, the operating generator was below 100 amps and the second engine was started. One neat feature on the VEMD was an optional graphic display of the cyclic position to aid in cyclic centering. A dot representing the cyclic position is located in a circle and shows the relative position of the cyclic from center. This is really a nice aid for keeping the mast moment in limits while on the ground. Although it’s an option, I can’t see why anybody wouldn’t want it included. There wasn’t much to check prior to takeoff. 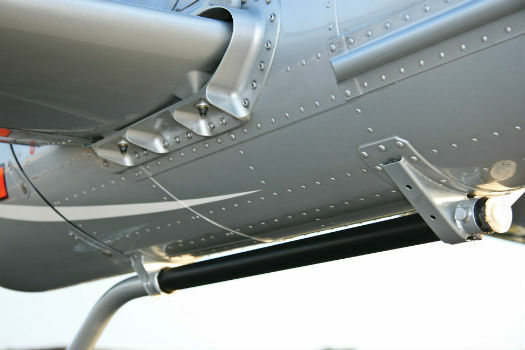 The avionics are simple to set up; prime pumps are turned off, transfer pumps are turned on, instruments are checked and set, and the twist grips are rolled to the FLIGHT position. Typical to the breed, the left skid is last to come off for takeoff and the first to touch for landing. There is no stability augmentation system (SAS) for the cyclic, only for yaw. But the cyclic does have a trim switch, as well as a force trim release button. I did some brief hover work at the Metro plant to get the feel of the helicopter, and we were ready to leave the area. The aircraft’s rotor RPM goes to 101 percent in the hover at a density altitude (DA) of 3,600 feet or lower. It then increases linearly to as high as 103.5 percent as the DA climbs to 6,500 feet. Once the aircraft speed reaches 55 knots, the rotor RPM decreases automatically to a normal cruise value of 96.5 percent. We left the plant and cruised to the practice area. Sure enough, as we passed through 55 knots, the rotor speed decelerated. I set cruise torque at 60 percent. Shades of my limited and distant past in the BK-117 came back as I experienced the sensitive ride of the rigid rotor system. And I was certainly busier without any cyclic SAS. The HeliSAS option is going to be most welcome in this helicopter. Even “trimmed”, there is no real relaxing on the cyclic; you are constantly flying this helicopter. My recent experience flying the HeliSAS proved to me that the benefits of the HeliSAS will reach far beyond just those EC145e operations that involve cross country flying. The ride was generally smooth but I could feel a slight “buzz” from the main rotor system. Our true airspeed was 137 knots; this wasn’t bad considering the miserably hot and humid conditions we were flying in. We arrived at a grass field for some pattern work and additional hovering. My first approach was normal. The rotor RPM came back up to 101 percent as the speed lowered through 55. I felt very at ease. Although I hadn’t flown a BK in 30 years, my experience with the EC135 made this feel quite comfortable. I stopped at a hover and did some basic work such as pedal turns and side flight. During side flight to the left, I felt a little rumble and tail wagging. This was caused by turbulence between the tail rotor outflow direction and the direction of flight (into a light wind). But once I broke through it, smoothness prevailed. Michaelson said the EC145e would easily slide sideways at 45 to 50 knots. He demonstrated this and, to no surprise, he was correct. We were showing 50 knots to the right. He reversed the direction and we showed 47 knots. Here’s where the quick response of the rotor system pays off. It was my turn to try it. The EC145e “e-lite”, as it is being marketed by Metro, is a very plain, utilitarian aircraft. Old habits are hard to break, and Michaelson had to advise me to apply pressure against the cyclic trim a little bit instead of holding down the force trim release button. I went sideways to the right and hit 47 knots — and it was silky smooth. Following a very mundane quick stop, I did another pattern circuit to do a steep approach. The simple, clean panel with the G500H sure makes it easy to quick scan; that’s a nice thing about the basic configuration — there isn’t much to fool with. With nothing but clear glass up front, obtaining a nice sight picture for the steep approach was easy. I didn’t even have to kick it out of trim for a better look. I was careful to keep my rate of descent at or below 300 feet per minute to guard against inducing settling with power, a situation that, according to Michaelson, is easy to get into in this aircraft. (Conversely, I didn’t find that to be anywhere near the case during my years of flying the EC145’s sister ship, the EC135). We departed the pattern to do some steep turns. 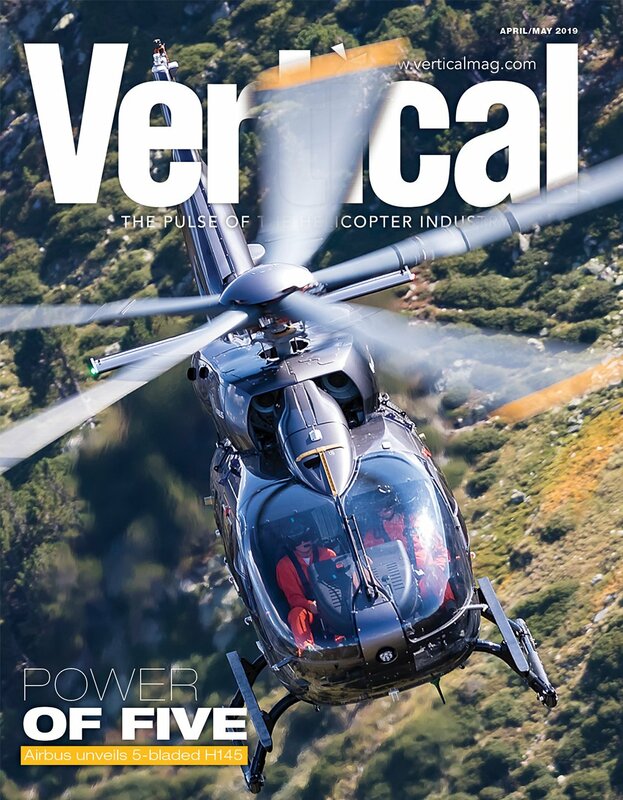 The EC145e was rock solid and easy to maintain altitude — but you do feel every bump in that rotor system. That said, at least it has yaw SAS. Hovering out of ground effect was a non-event and no significant pedal pressure was needed. There was plenty of tail rotor left over. I felt just a little vibration and a rumble when turning tail into the wind, but there was no tail wagging. The author noted that the EC145e retains all of the snappy handling of the BK-117 series, aided by yaw SAS, but still required constant attention to the controls. With that task completed, it was time to head back home. Michaelson loaded our destination into the GTN 650 — just because I asked — and I flew the magenta line back home on the G500H. It’s been quite a while since I last flew a helicopter of this caliber that had no autopilot and no SAS. But by this time I was pretty relaxed in the ship and it just felt natural. Arriving at the Metro complex, I shot another steep approach to a landing, and we were done. I admit that due to the short lead-time I had for this flight, I really didn’t do any advance research on the EC145e. So my flight went from an anticipated “all-in” major systems and avionics flight test story basis, to one of back to basics. And it was nice getting back into the BK. Whether you’re a graybeard with lots of time in older BKs, or a “newbie” to the type, I believe you’ll welcome the experience of the EC145e. To me, the EC145e is a package that makes sense, combining a time-honored airframe from Airbus with the innovative and respected completion capabilities of Metro. And it’s a package that delivers more utility for less cost. “We feel that there is no other aircraft model on the market right now that will fill this light utility airframe [mission],” said Geltz. I need to know if the EC145 and the BK117 have the safer leak proof fuel systems.